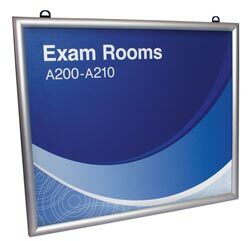 Full color, durable sign inserts. Send us your layout ideas or have us design your full color sign inserts - made for our SUSPSNAP Series products. 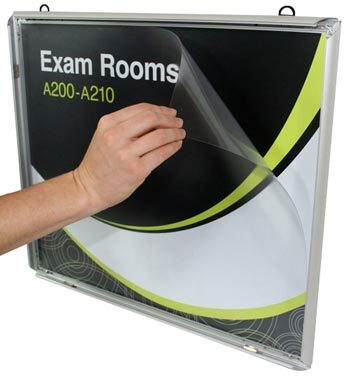 Our durable sign inserts are cut to size to fit the various-sized Curved Ceiling Sign Frames we offer and are easy to change and update with the use of a suction cup to remove the lens. Please contact us at (701) 526 3835 or service@officesigncompany.com for numerous size variations and design options for your inserts. Full Color Sign Inserts for Easy Corporate Identification Updates. Our inserts are sold individually - please update QTY field accordingly. If ordering inserts for both sides of your sign you will need to order a quantity of 2.